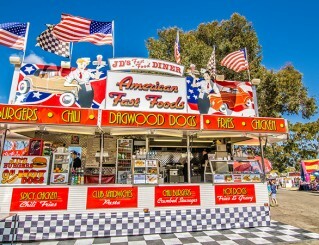 JD’s Diner is an American-themed 1950’s/60’s diner. What’s a diner without rock n’ roll music? 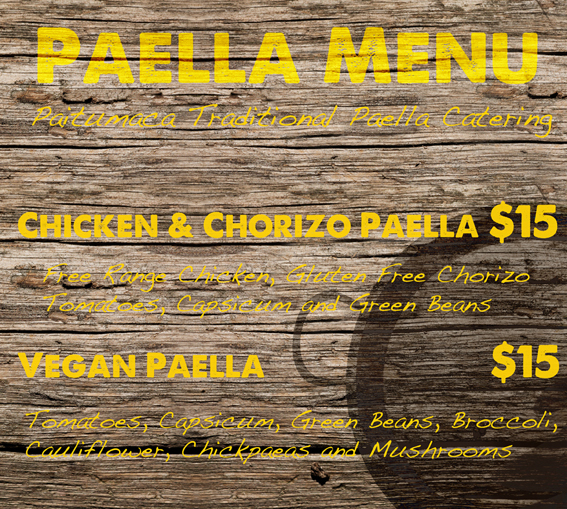 We have plenty to accompany our fantastic menu for fast food junkies, chilli lovers and vegetarian taste buds. 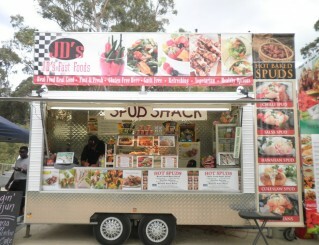 JD’s Diner won the Best New Exhibition award at the Perth Royal Show. 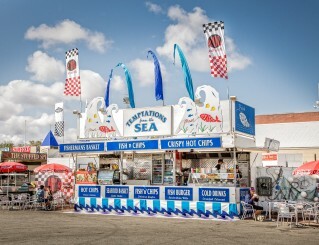 For larger crowds and events, you can order tables, chairs, umbrellas and a rock n’ roll-style back-drop area complete with roller-skating waitresses! 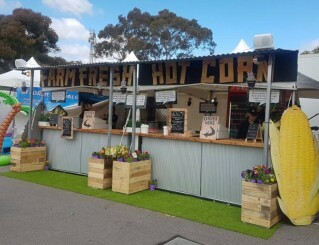 JD’s Corn Stall is always filling the air with sweet smelling, hot and fresh corn. Made fresh however you like it. For the health fanatics, our healthy van has an assortment of gluten-free and healthy foods available for your next event. We take pride in being able to offer the largest range of gluten free products. 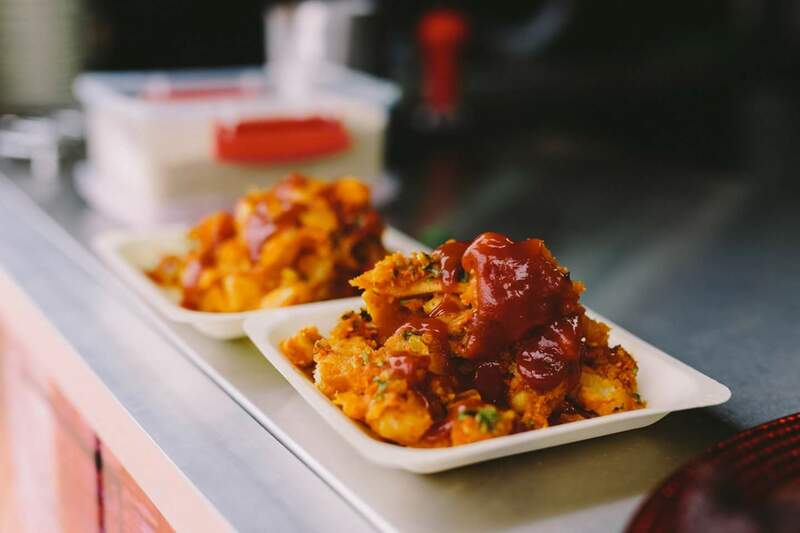 We also serve our healthy hot-baked spuds – definitely a crowd-pleaser. 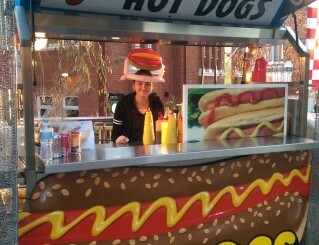 JD’s Hot Dog Stall is always ready to turn out hot and fresh 9″ hot dogs, made however you like it. 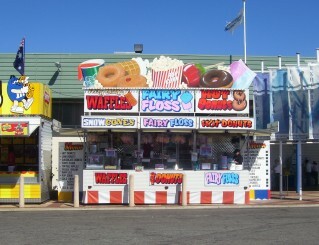 CANDY CASTLE at the Royal Show Only. 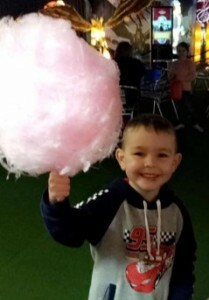 You’ll love our traditional, freshly made fairy floss on a stick or in a bag. 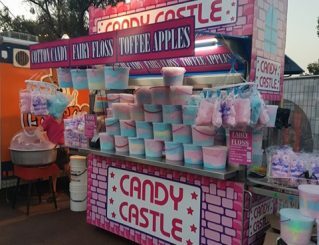 Fairy floss is also available in a handy, family-size bucket. 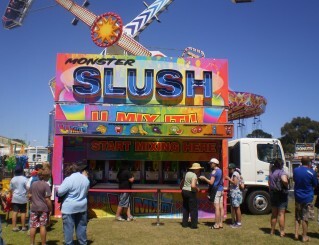 We also make shaved ice snow cones with assorted cordial flavours. Snow cones come in small, medium and large cups and assorted coloured Super Sippers. 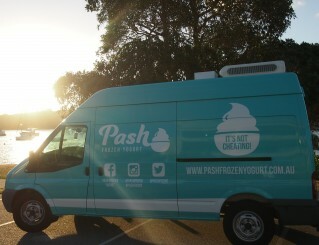 We recommend either the fairy floss or snow cone stall as a fantastic addition to your next social event. 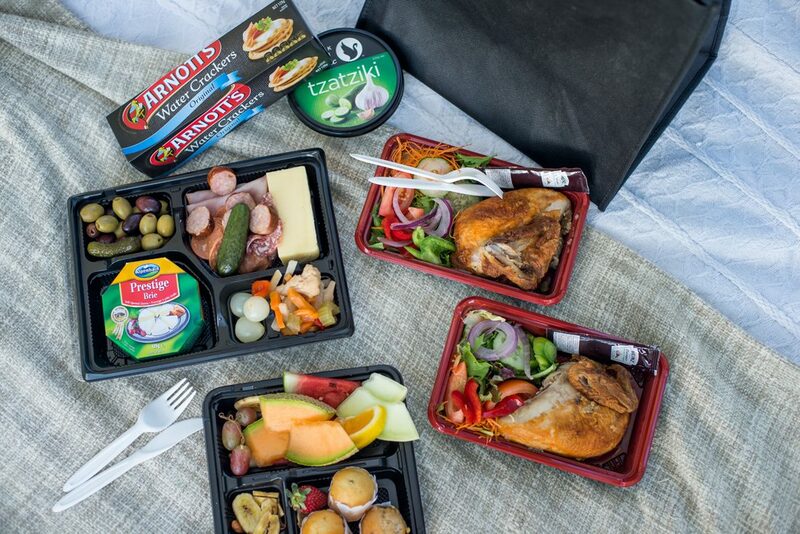 No need to pack a picnic JD’s has you covered! 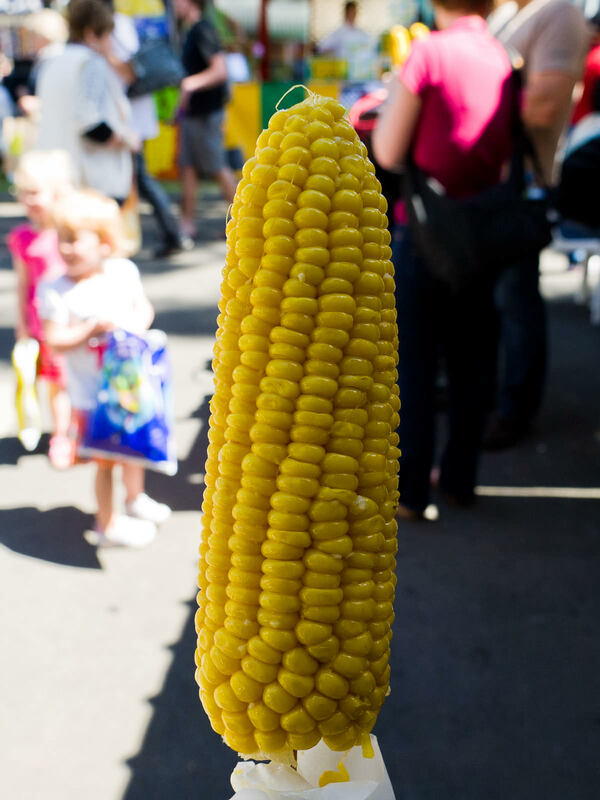 Exactly how great does carnival food taste? 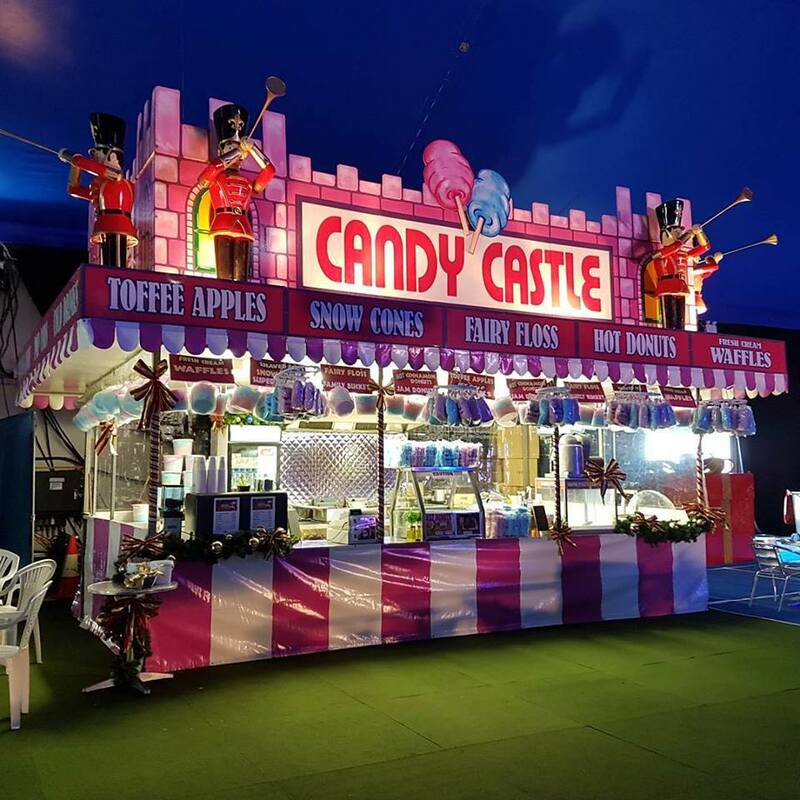 For a fun outdoor event, hire the carnival catering van that makes hot food to go including burgers and hot chips, donuts, waffles, cold drinks, ice slushies and of course, fairy floss. 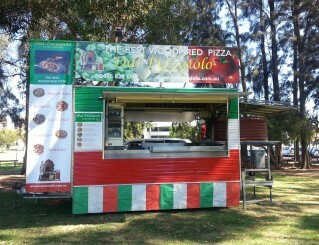 Will be at events an be found at Wonderland, and Kaleidoscope Lighting Festival! 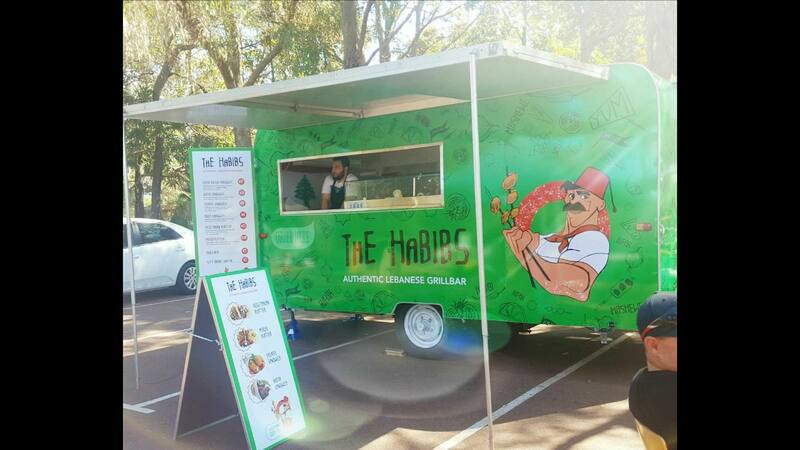 The Fish Boss is the newest fish & chip shop on wheels, cooking only the BEST Australian Seafood he can find. 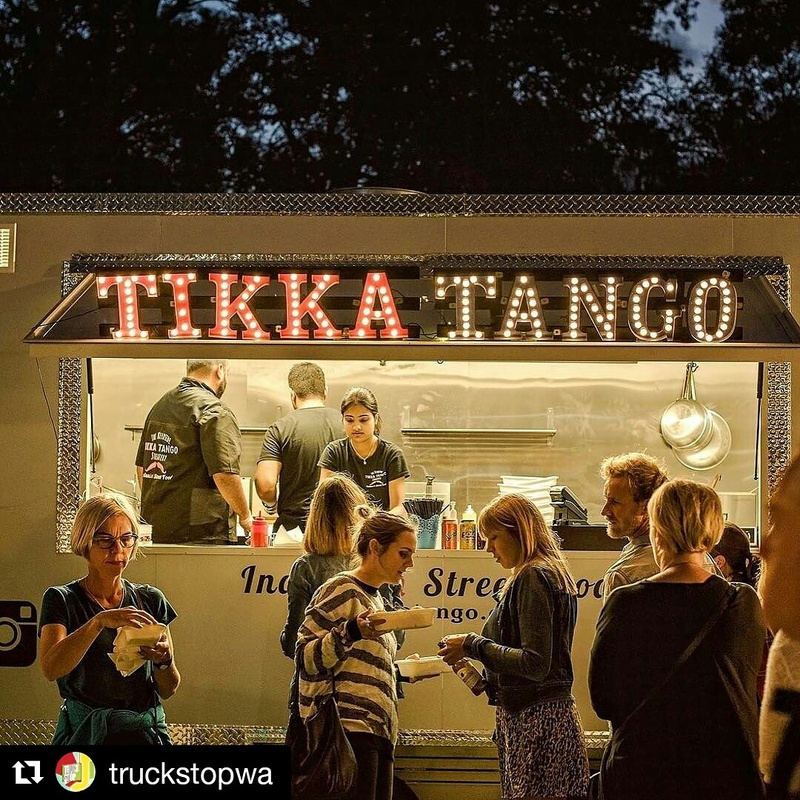 Tikka Tango has been serving some delicious Indian-ish street fare since a few years to the people of Western Australia, their paratha tacos are a hit with people of all ages, you can catch them at a lot of events, music festivals, markets in and around perth. 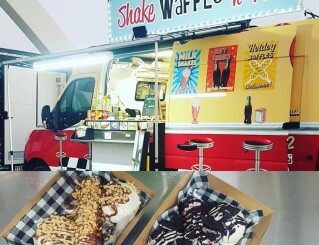 Shake Waffle ‘n’ Roll mobile food van serve freshly baked waffles on a stick & delicious thick shakes. 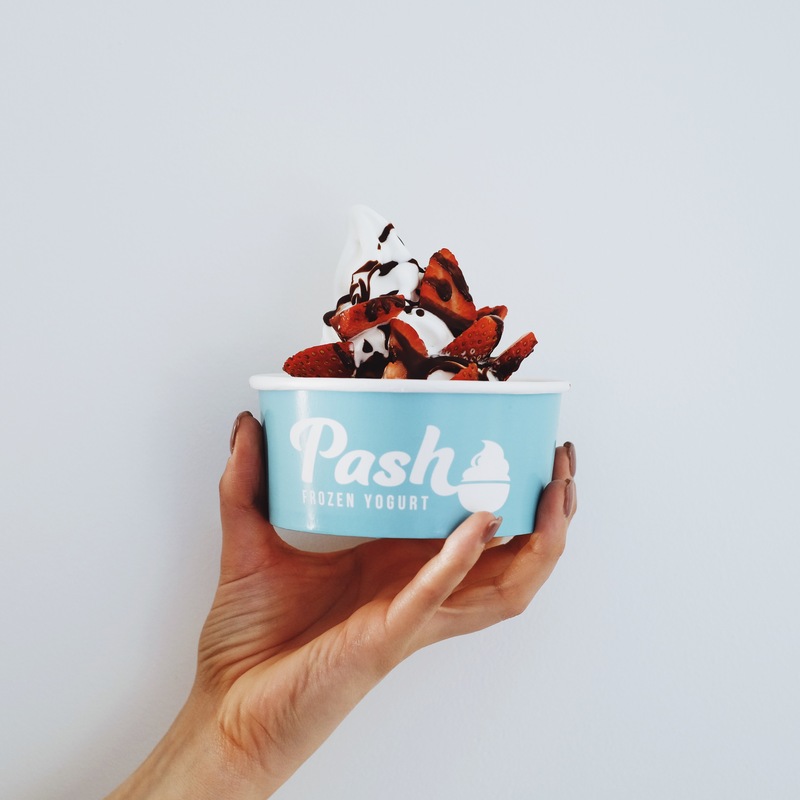 We use locally sourced ingredients & all our packaging is made from sustainably sourced renewable or recyclable plant based materials. 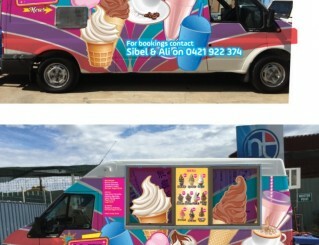 Waffles on wheels…..what dreams are made of!! 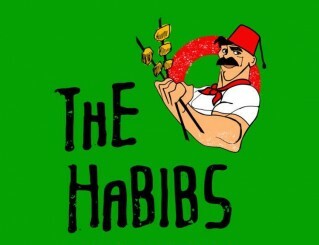 THE HABIBS the first mobile Authentic Lebanese Grill Bar in WA,with the booming of the Lebanese Cuisine in the region,we thought of bringing it closer to the people of Perth.We do all from Shish Taouk,Kafta,Lamb skewers ,grilled to perfection and served in wraps and platters,to traditional mezze like Kebbe,hummus and Falafel. 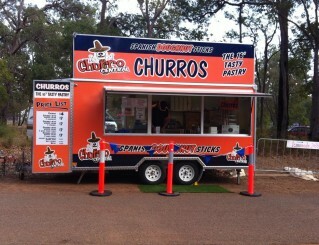 Find Churro Central at upcoming events such as Kaleidoscope and Christmas Pageant, like them on Facebook!! Sujit & I (Dear aka Pahnan) are passionate about healthy and happy lifestyle. We are also passionate about a green environment that is plastic free. We worked in the corporate world for more than 12 years. 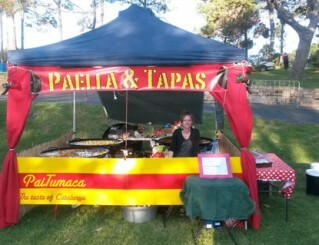 Apart from Australia, we have also worked in countries in Asia and Europe. We met each other in Copenhagen, Denmark while originally being from Thailand and India. 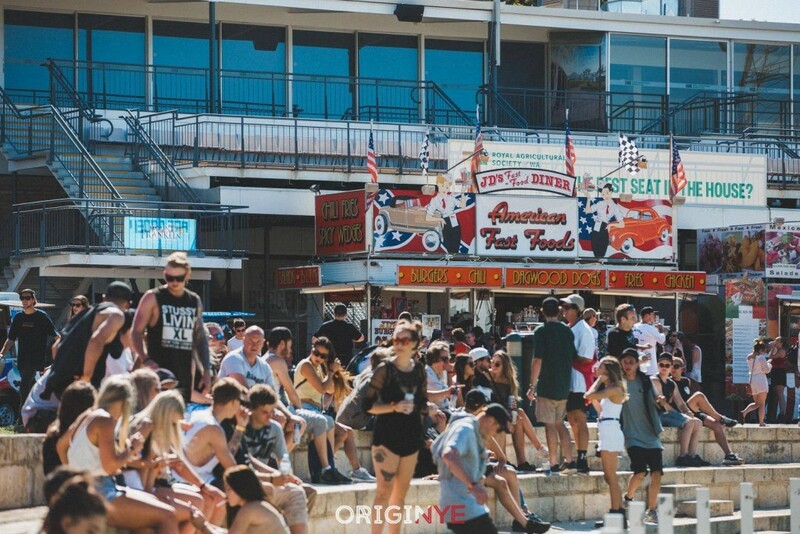 After travelling to more than 30 countries around the world we fell in love with Australia and decided to settle down in Perth. In 2012 Sujit was diagnosed with Ulcerative Colitis (IBD) and was prescribed medication that he would continue for the rest of his life. Medicines (steroids and immunosuppressant) are harmful and we thought there must be an alternative. After a lot of online research, Sujit followed a raw diet based on the theory of a Canadian Scientist. 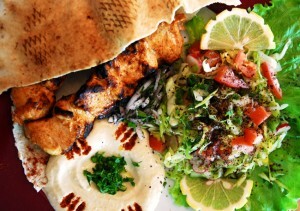 The diet consisted of vegetables, fruits, soups & raw food. Sujit recovered after 4 weeks but continued the diet for another 18 months and is now healthy and fit without the prescribed medication. In this journey of 1.5 years, we learned a lot of recipes of healthy juices, smoothies and raw snacks. We became even more passionate about such food. 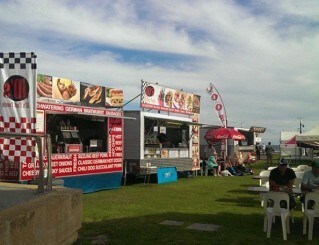 In Perth City, it’s hard to find places where you can get such raw food. So we decided to do something about it. 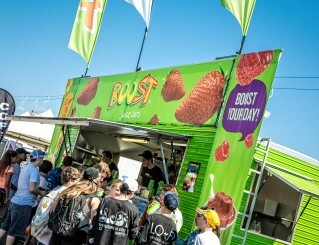 And the idea of Juice Station came to our mind. 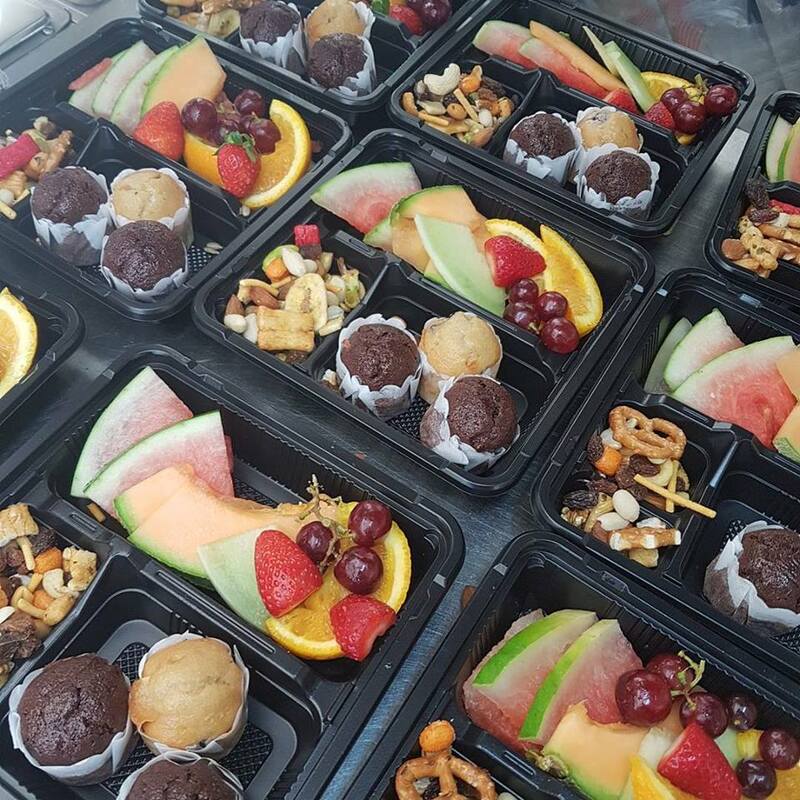 We wanted people to have an easy option in the city to get raw juices, smoothies and snacks that are free from sugar, processed food and preservatives. 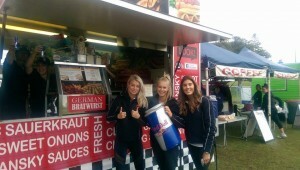 We started with Cold-Pressed Juices, Vegan Sugarfree Smoothies and some raw snacks. More to follow in near future. We also aim to be plastic free and we have managed to be 99% plastic free so far. 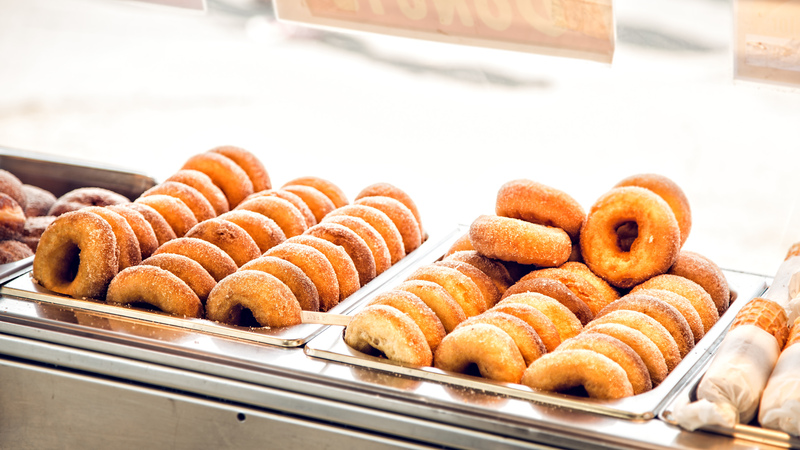 Have a sweet tooth? MJ’Z Ice Cream has you covered with their delicious menu! 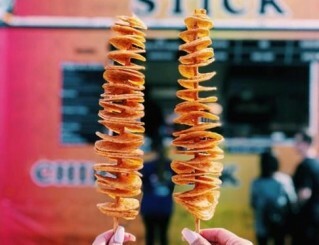 Find Curb Your Hunger at Wonderland 2016! At W onderland 2016 and By The C! 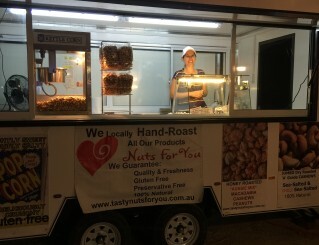 Find Nuts For You trading along side JD’s at Kings Park Botanical Gardens at some of the Mellen Event concerts. 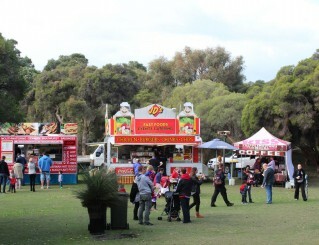 Check ‘Upcoming Events’ on our website to find the food vendor line up at these events. 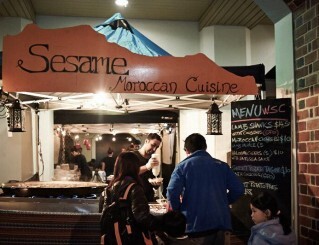 Sesame Moroccan Cuisine has been bringing his Moroccan shanks, cous cous, quesadilla and other tasty treats to events all around Perth, including concerts like Simply Red, Diana Krall, Rob Thomas, Tom Jones and much more. 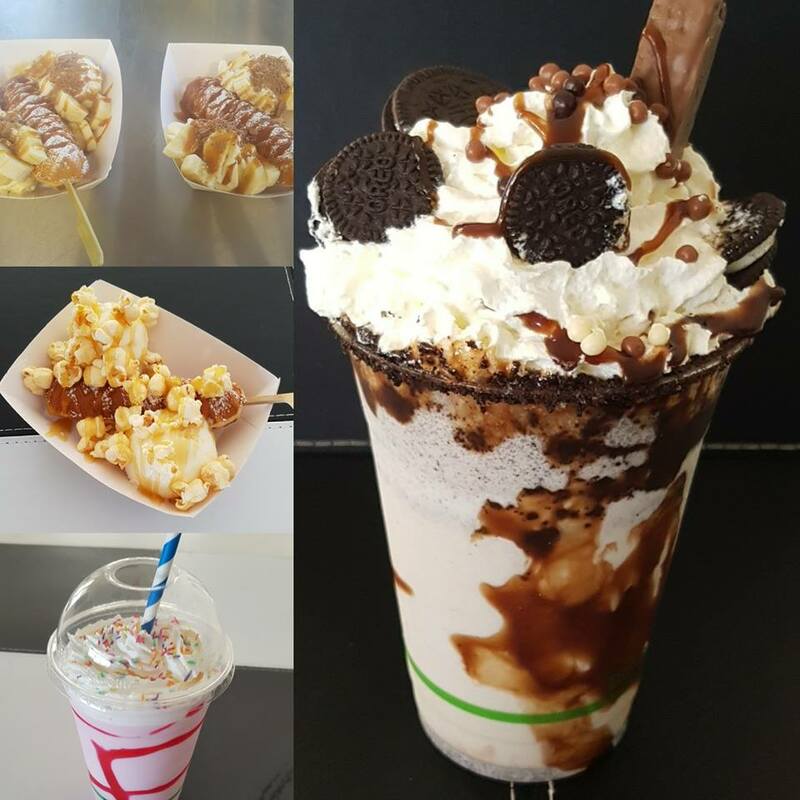 From markets to weddings, parties to festivals, wherever there’s a penchant for pops, you can bet your sweet patootie Delish Ice can satisfy it with their delicious artisan ice pops. 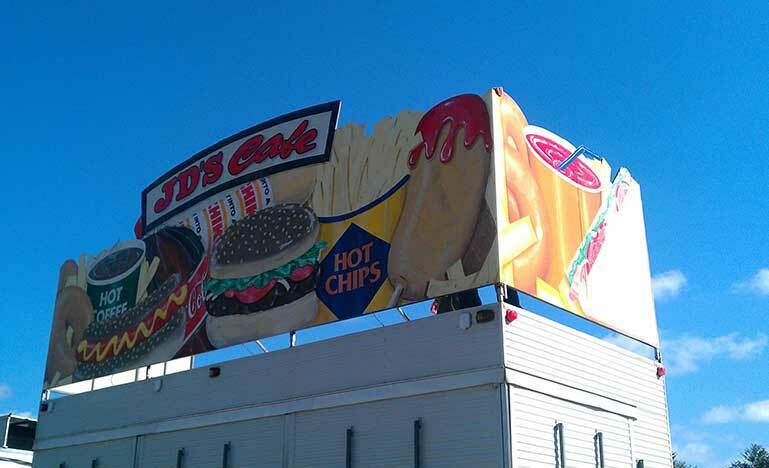 Delicious food is our priority at JD’s Fast Foods. 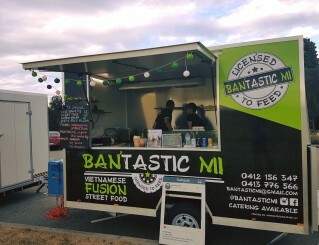 We are a mobile catering company based in , Western Australia, ready to treat your tastebuds. 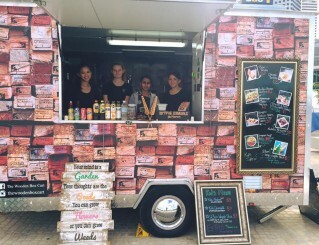 With a variety of menu options, and catering vans, we provide a service for everyone who enjoys good food. 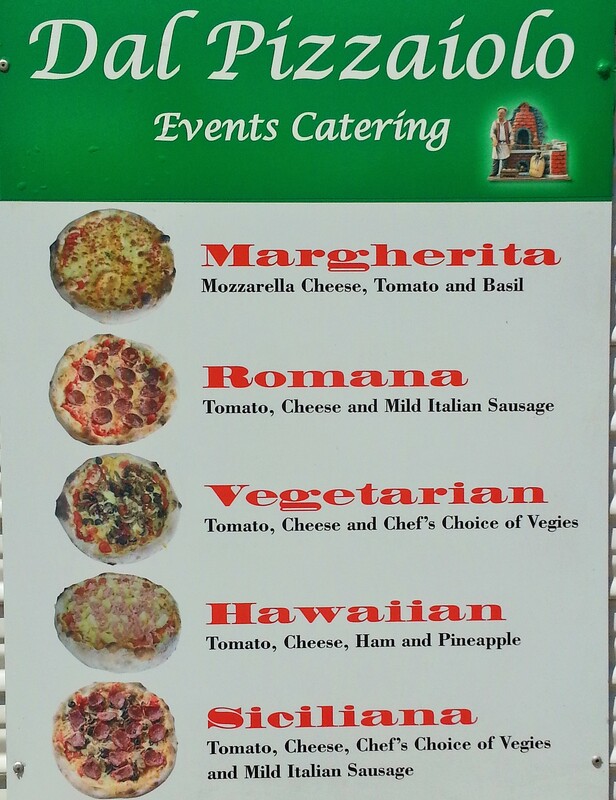 In addition to that, our professional and reliable service makes us the perfect catering choice for your special event. 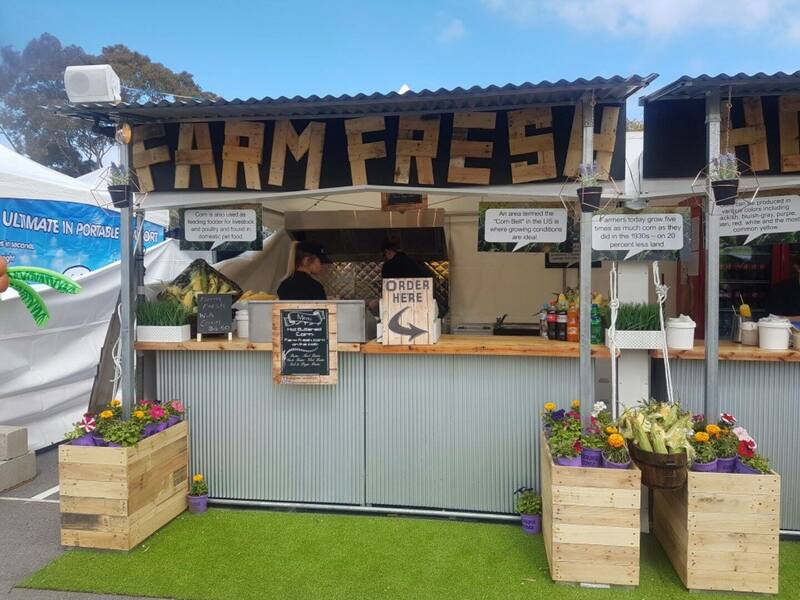 Choose a food van theme based on your event; we have a wide selection available from pizza and German sausages to burgers and seafood. 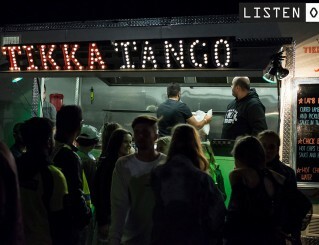 Whether it’s a concert, fair, festival, concert or sporting event, our friendly team takes care of all details including permits, stock, staff, setup and electricity. 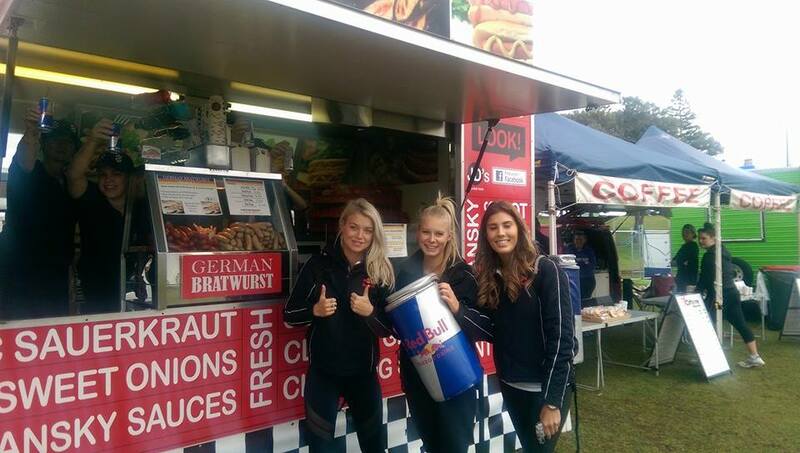 We regularly cater for events as large as the Perth Royal Show and the Big Day Out. 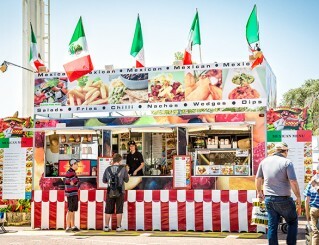 Our themed mobile catering vans all have the necessary Foodsafe accreditations and adhere to strict hygiene standards at all times – from the facility to the staff’s attire. 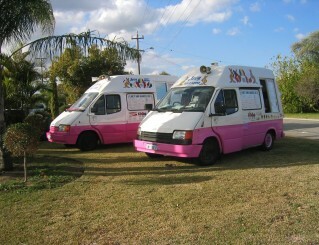 Our hands-on management ensures that our vans are extremely clean and our uniformed staff are fully trained. 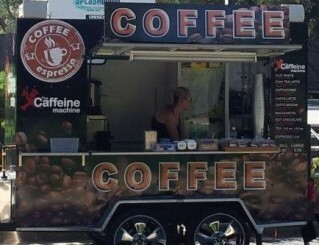 Whatever your requirements, we are happy to accommodate your needs wherever possible. 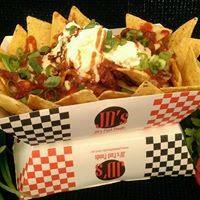 For all your event catering needs, contact JD’s Fast Foods.